Update July 3, 2015: The voting is now ended, and unfortunately we did not win. Thank you to all who voted for us. Some very deserving projects won, and we are genuinely happy for those worthy organizations. Voting ends 31st May so don’t forget to vote for us to win sponsorship from Jewson Builders Merchants to help fund some exciting new structures at the farm! All it takes it one click! 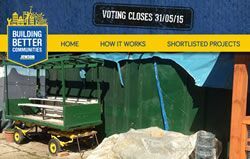 Visit buildingbettercommunities/kentish-town-city-farm and ‘Like’ our entry to vote for us. Read more about our proposal and place your vote now!